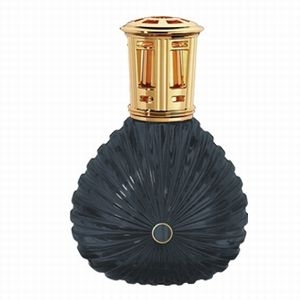 This heavy glass Lampe Berger Caroline Black Lamp with gold embellishment has the classic French shell design. Called by Lampe Berger the "Caroline" after the French for "Song of Happiness", this lamp will surely make you delighted. It comes with the heavy gold top in a nice gift box with a burner, instructions and funnel. This lamp is now retired.